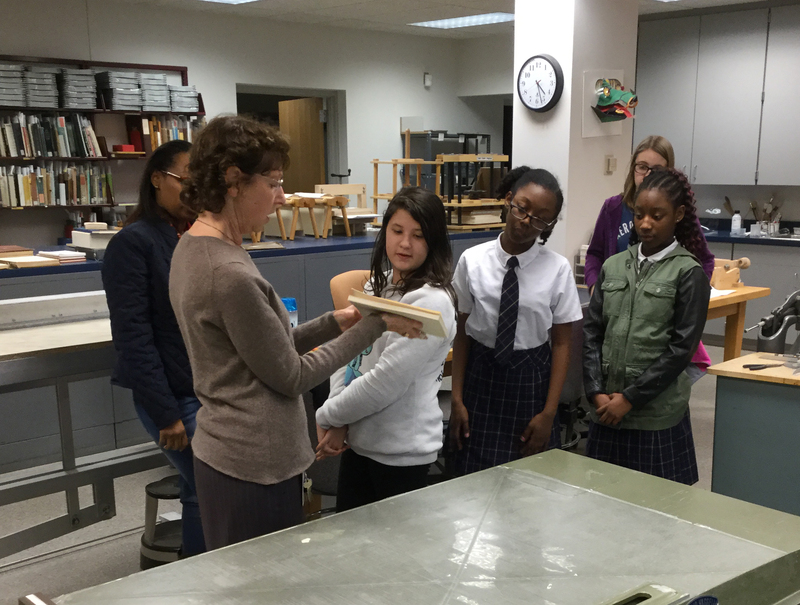 The Preservation Department and the Auxiliary Library Facility (ALF) hosted a group of local students this week for a tour. 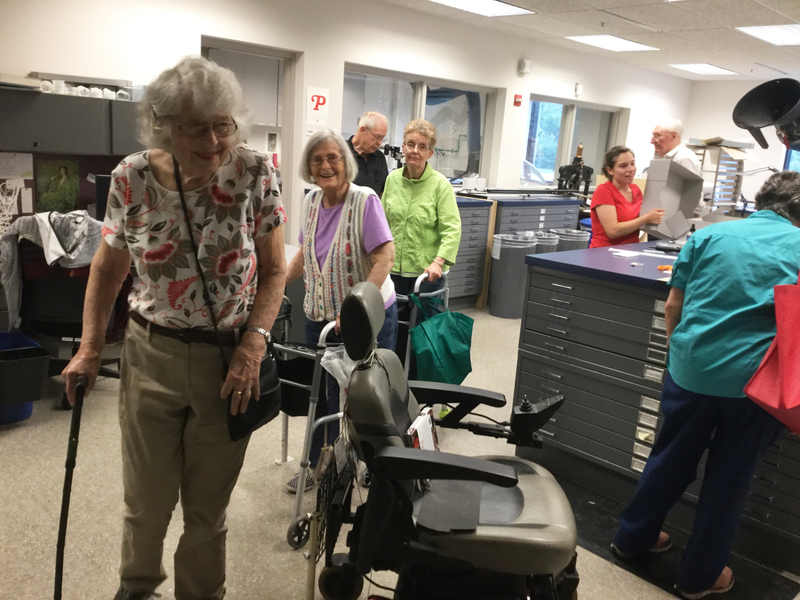 The students are taking art classes taught by Sandra Tokarski at Bell Trace, a senior living community just down the road from the lab. 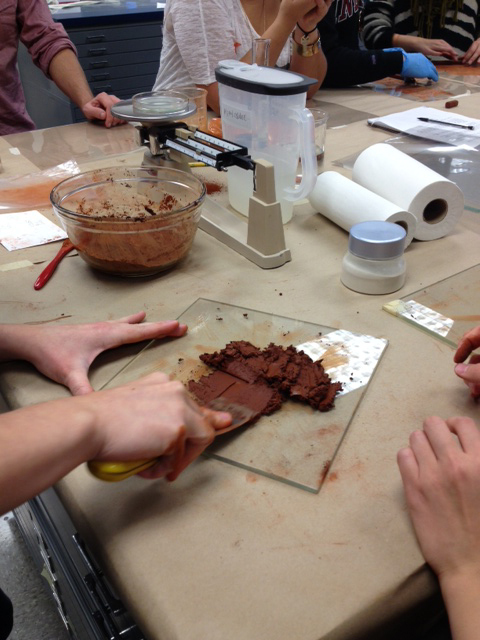 The art classes cover a wide range of media, and most recently they did book arts. So I guess their visit was kind of their capstone experience! 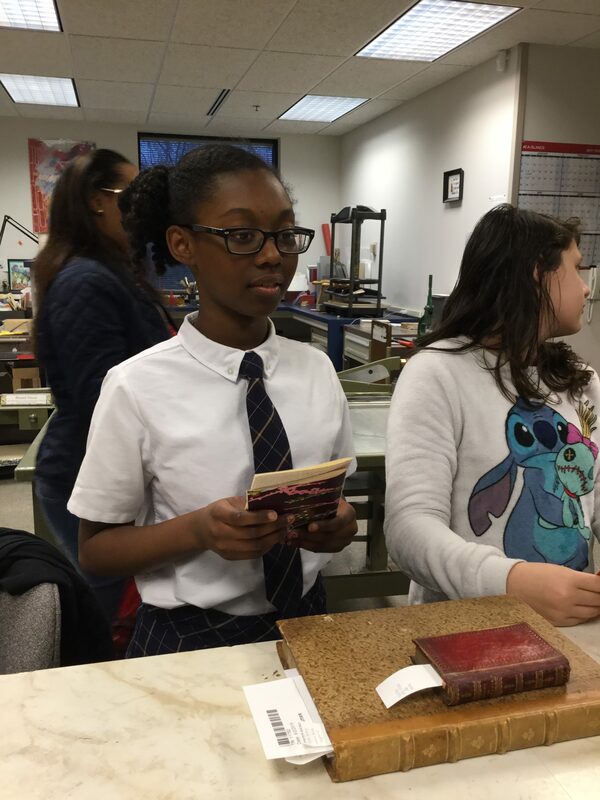 They were especially interested in some of our big equipment, such as board shears, book presses, and hydraulic guillotine, since their book making was done using only hand tools. Above Lara Tokarski demonstrates the guillotine, which cuts cleanly through thick stacks of paper and can be used to trim the edges of text blocks. Here is Vaughn Nuest dazzling the group with facts and figures about the ALF. 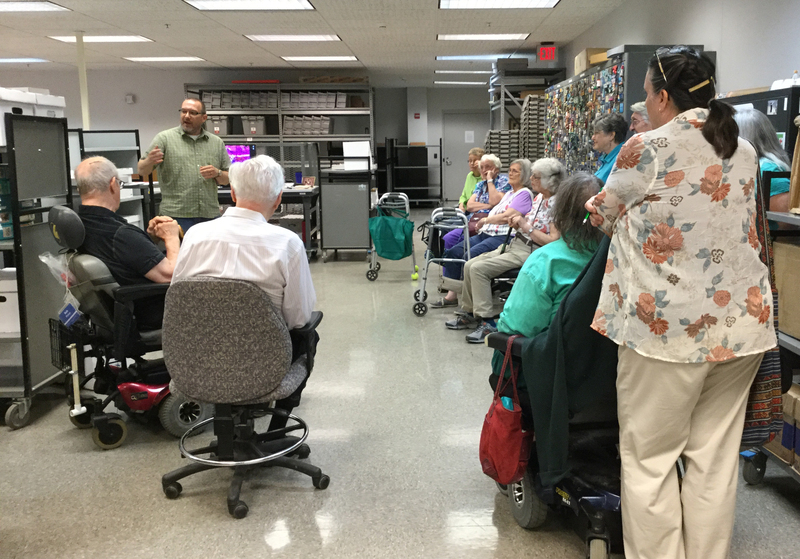 They also were treated to a peek inside the vault where millions of the Library’s books, archival collections, and AV media are housed. 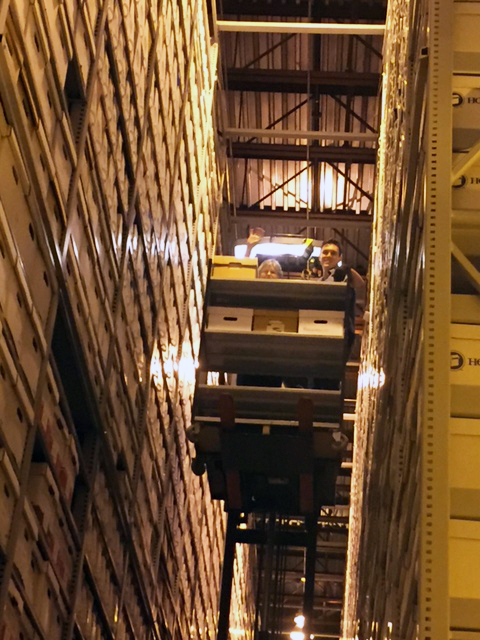 One brave soul, Sandra Tokarski, was treated by Brian Johnson to a ride on the lift truck! I’m not sure who had more fun — us or them! 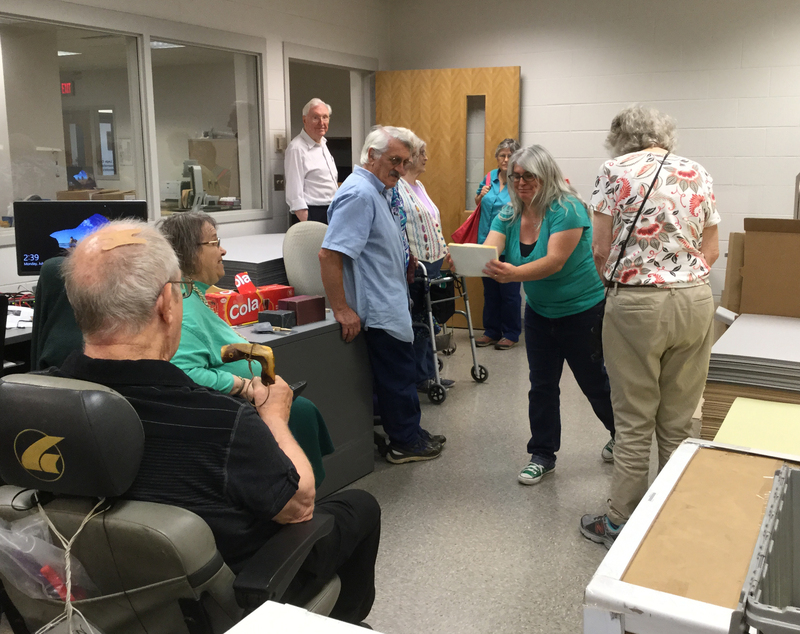 In April, we had a lovely visit from the Guild of Book Workers / Midwest Chapter, while they were in Bloomington for their annual meeting. Preservation practices must be able to respond to new patterns of use, and to collecting strategies that are constantly evolving. 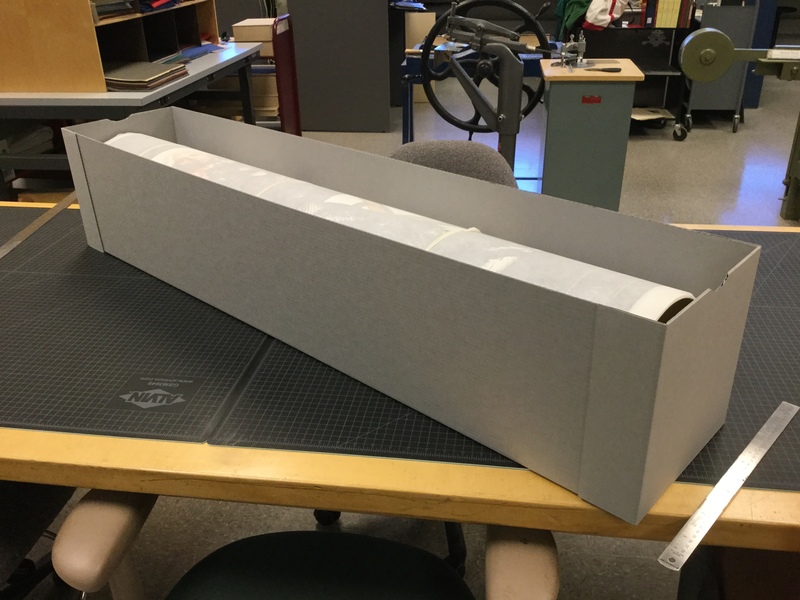 In the earliest days of library preservation programs, for example, a new type of use — the photocopy machine — helped lead to improved methods in commercial library binding. Double-fan adhesive binding, which has for the most part replaced oversewing since the mid-1980s, allows volumes to lay flat for good capture without causing damage. 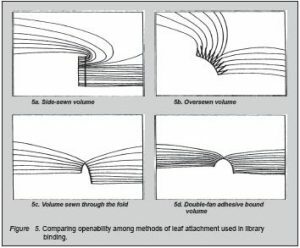 Openability of different binding methods, from Guide to the ANSI/NISO Library Binding Standard, 2000, by Jan Merrill-Oldham and Paul Parisi, illustrations by Gary Frost. Oversewn volumes (top right) may have tight bindings and text at the inner margins is sometimes obscured. Double-fan adhesive bindings (lower right) open flat. And so much has changed in academic libraries over the last two decades. 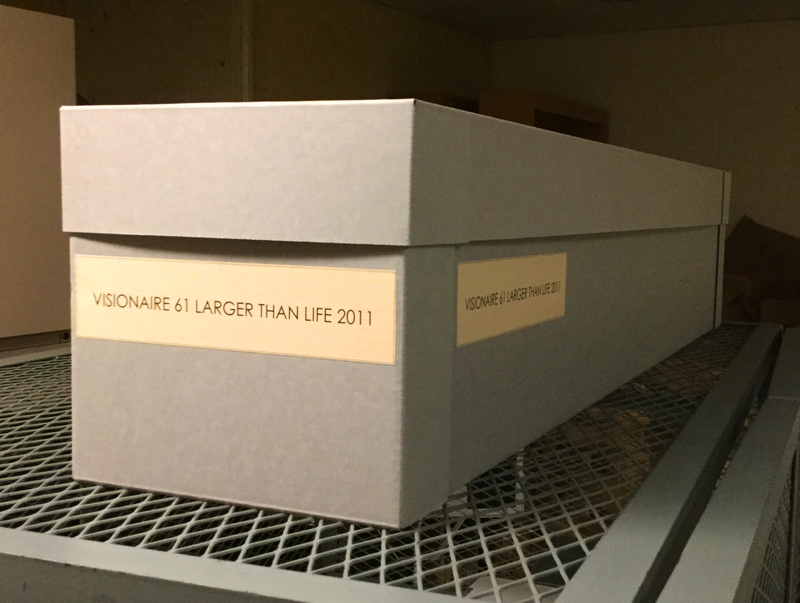 Libraries have adjusted their collection management strategies for print collections in light of the wide availability of digital content, lower use of print, and demand for the space that print collections have occupied in library buildings. Information resources lead long lives (if they survive) and their value may change over time, so preservation efforts must be able to meet the needs of current users while keeping the long view in mind. 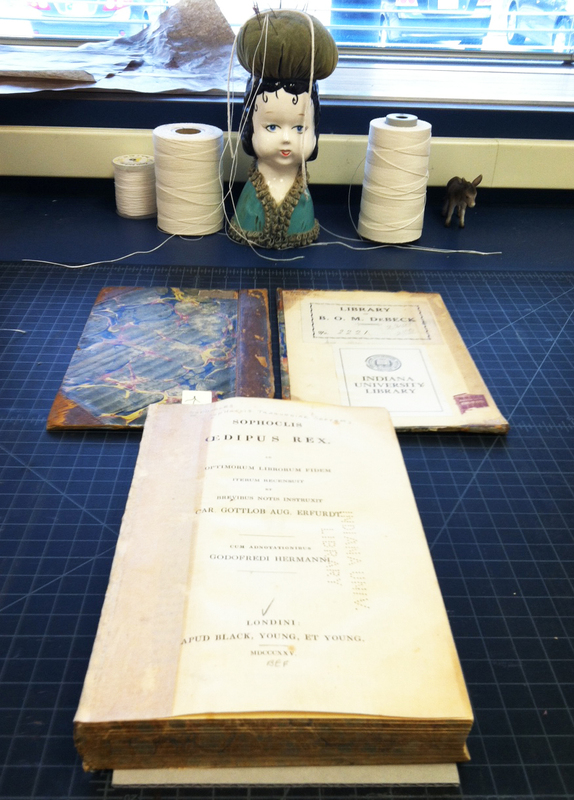 Today, selection for preservation and treatment decision-making both take into account these changing values and uses of the print collections. 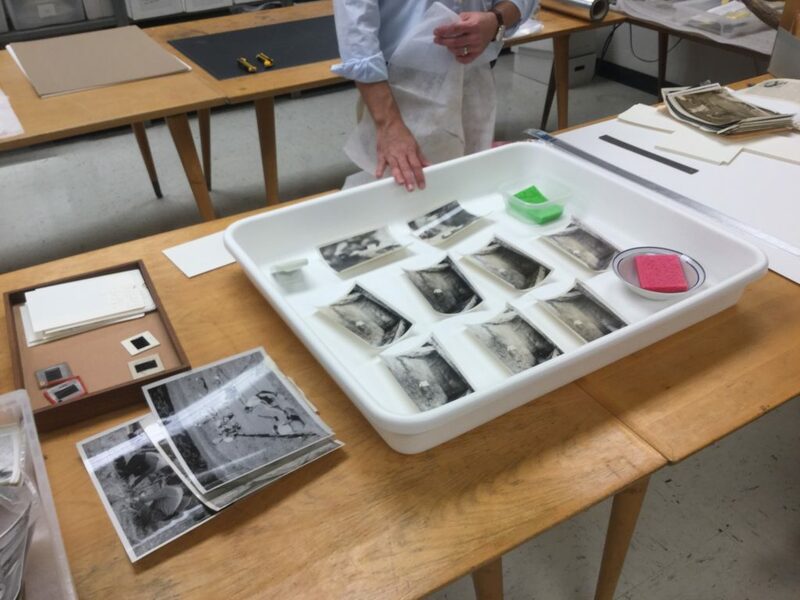 Envisioning the future value collections may hold, and factoring that into the actions taken today, is a challenging but fascinating part of the work of preservation. Likewise, the approach to the repair and conservation of research book collections has evolved to support these changing strategies and needs. Advances in techniques have come via cross-fertilization among practices in different conservation specializations. Traditionally, there was a “partitioning” of responsibilities for the remedial care of books in academic libraries1. Repair of circulating, or “general” collections adhered largely to standardized treatment protocols, or “treatment to specification” as described by Glen Ruzicka2. With this approach, the treatment for an item is selected from a set menu. 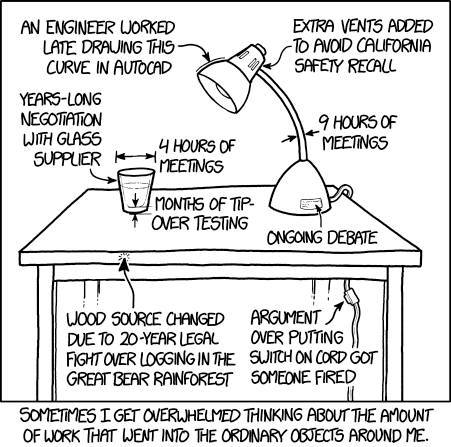 This provides both consistency and efficiency. 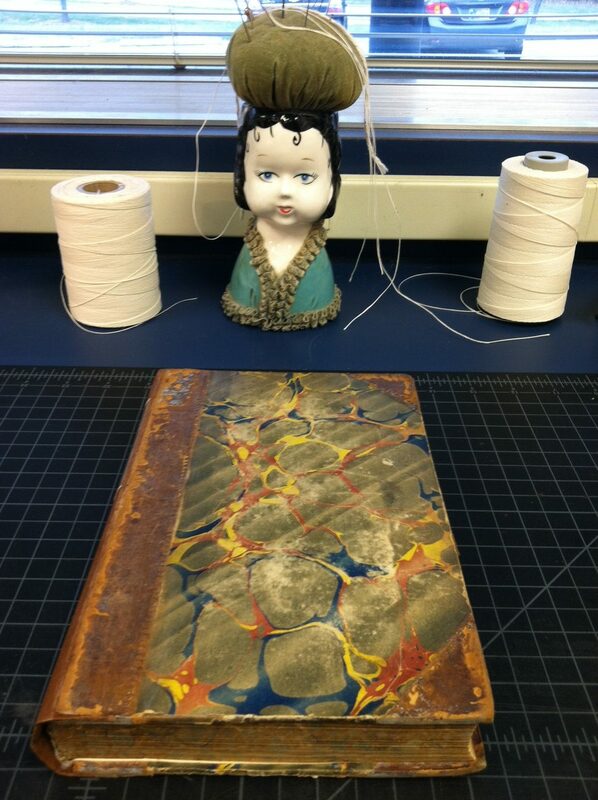 By contrast, rare book conservation treatment is customized for each item. 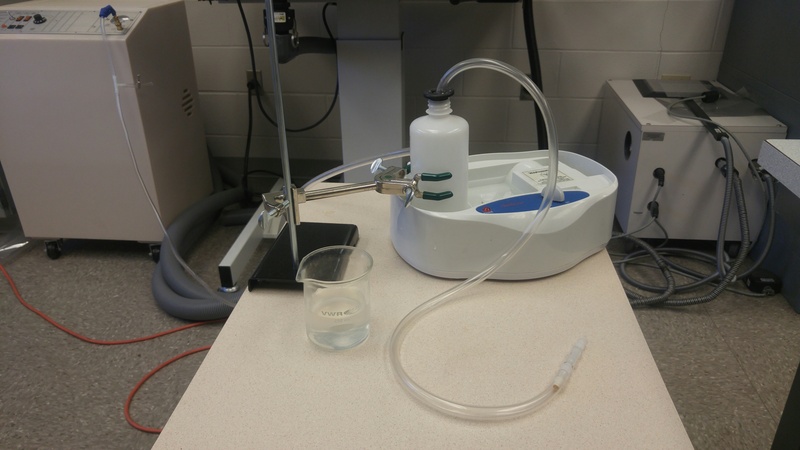 Typically, different staff in separately equipped labs applied these two distinct approaches, using different materials and methods. 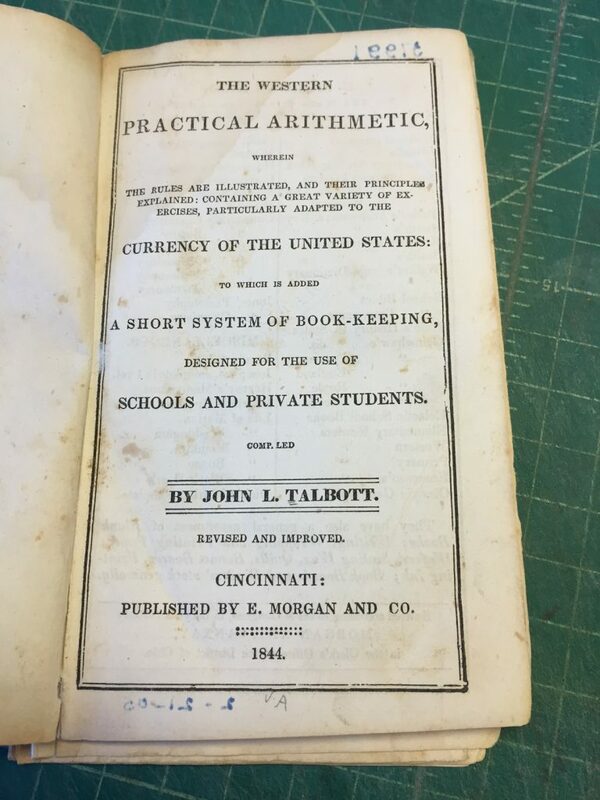 Also in the past, the high-use, circulating books for which standardized treatments were designed often consumed all the available resources for book repair. 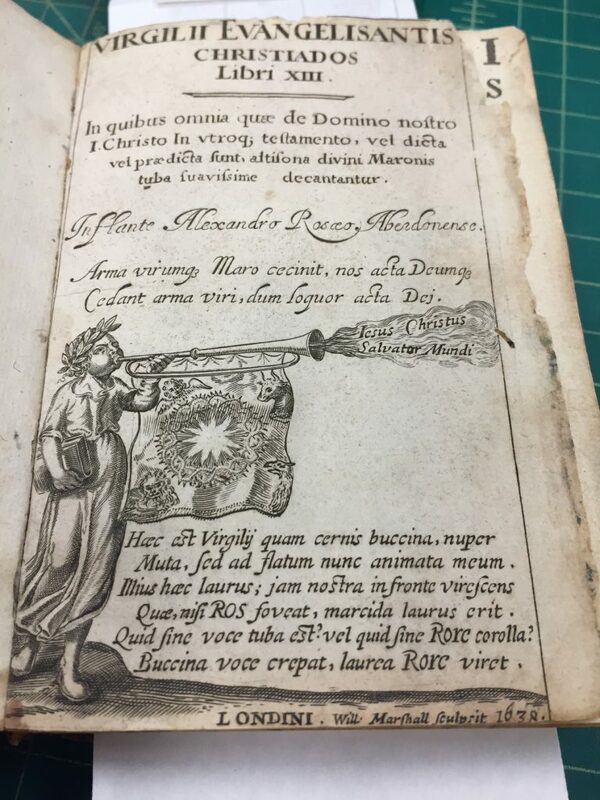 At the same time, rare book conservation focused on special collections. Older materials in the general collection sometimes fell between the cracks. This was partly due to their lower priority. 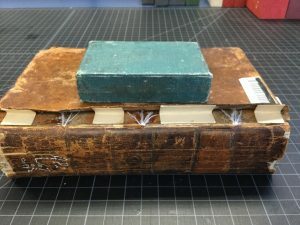 But it was also because the procedures and skill sets of general collections conservation labs were designed for modern, case-bound books with strong, flexible texts, not for older binding structures or the kinds of deterioration from which they suffer. Options for older materials may have included deferring action by boxing, or reformatting to preserve intellectual content. 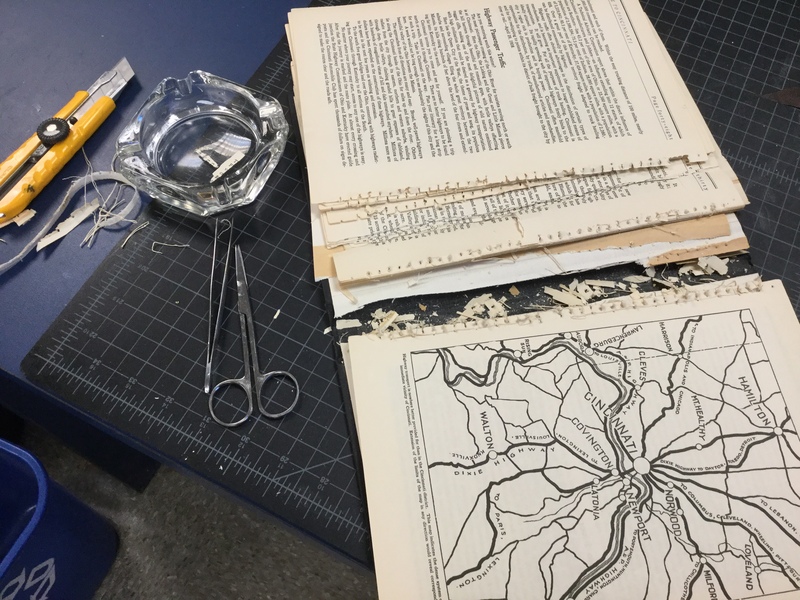 Today, new approaches to book repair, which began percolating in the 1990s, have led to greater integration of general and special collections conservation approaches3. 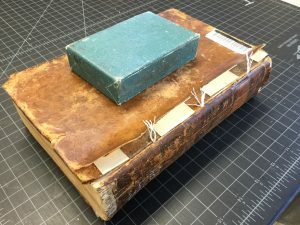 Techniques appropriate for older or “medium-rare” books have become part of the repertoire of general collections conservation today. These methods tend to be more reversible, less invasive, and are often less time-consuming. 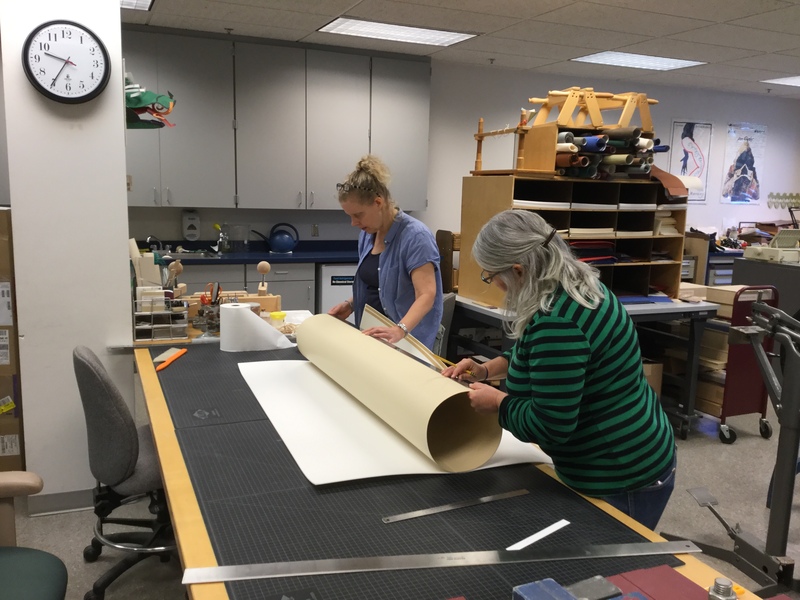 And some practices from the world of general collections that lend efficiency have been adopted in the work of special collections conservation. So with more tools in the proverbial kit bag, we now have the capacity to address the preservation needs of our collections more holistically. 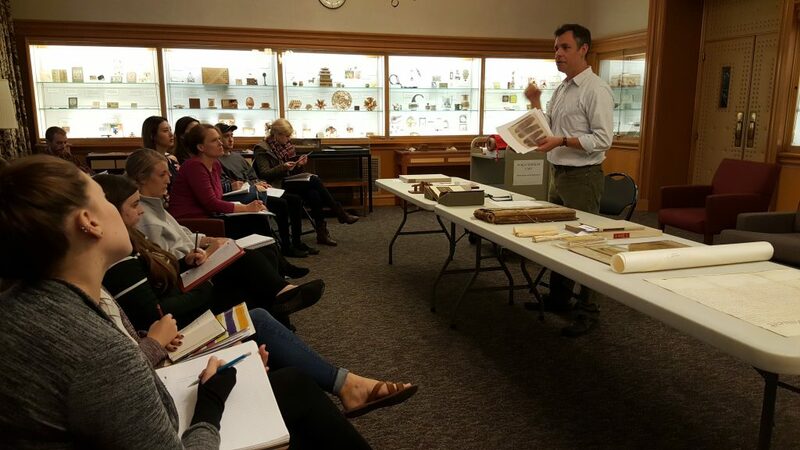 During the MWGBW tour, we showed a variety of techniques used in our lab to solve a common problem of 18th and 19th-century books – detached boards. The attachment fails due to deterioration of the materials, structural design, use, or a combination. 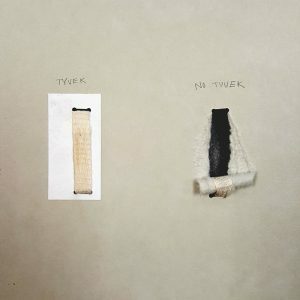 Our repertoire of board re-attachment methods includes Japanese paper hinges, linen tabs, full cloth hinges, cutaway cloth hinges, Ramieband, and one called thread staples. 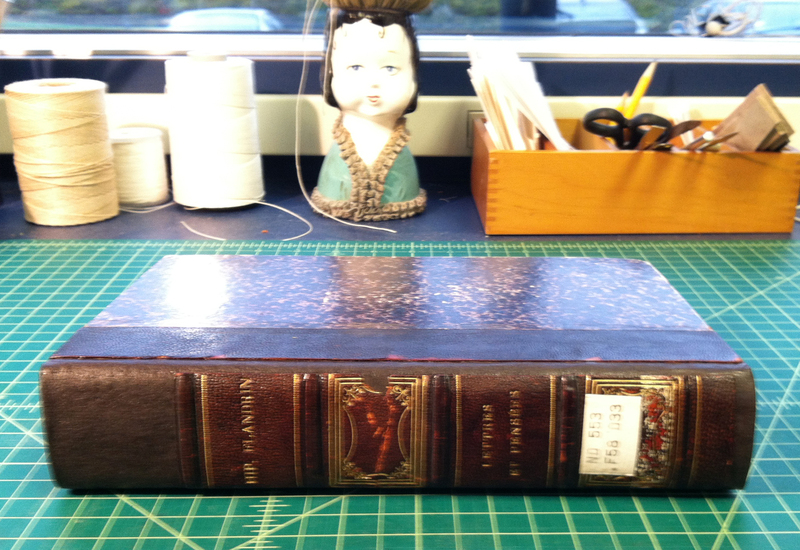 It is useful especially when you don’t have access to the text block spine, such as in a tight-back binding. 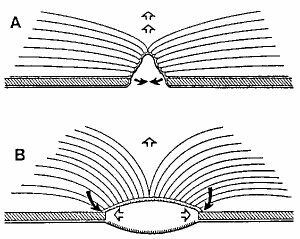 It is stronger than Japanese paper hinges, so it can be used on books that are a bit heavier or larger. The first and last signatures need to be well attached. 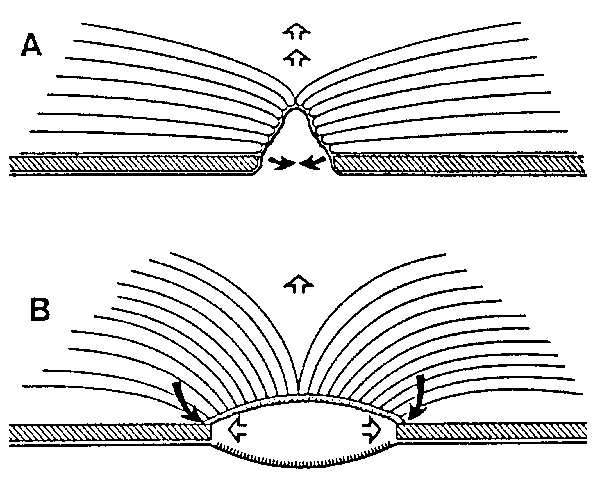 The cover material is adhered directly to the text block spine in a tight-back binding (top), vs. the hollow spine, which is attached at the joints. 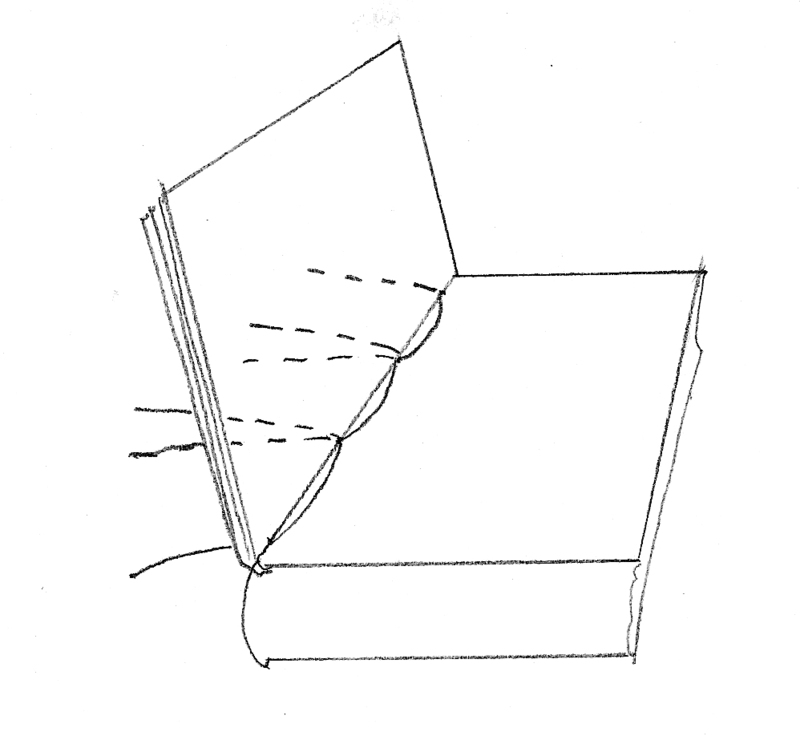 The basic idea for thread staples is that linen thread is sewn through the folds of the first and last signatures of the text block, and the thread tails are used to attach the boards. Sewing can begin from the inside of the signature and come out at the point of the shoulder, or from the point of the shoulder on the outside to the inside of the fold, whichever is easiest. It depends somewhat on the depth of the shoulder. If starting inside, you un-thread the needle after the first pass, put the needle back on the thread inside, and then sew through the next sewing station from the inside. This is how it looks after the sewing is done. I sometimes rub some thick paste into the threads right at the shoulder and press the tails toward the text block. 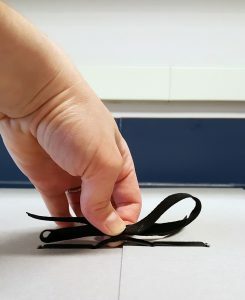 This helps get the thread to lean in the right direction, but also protects against accidentally pulling the threads out during subsequent steps. 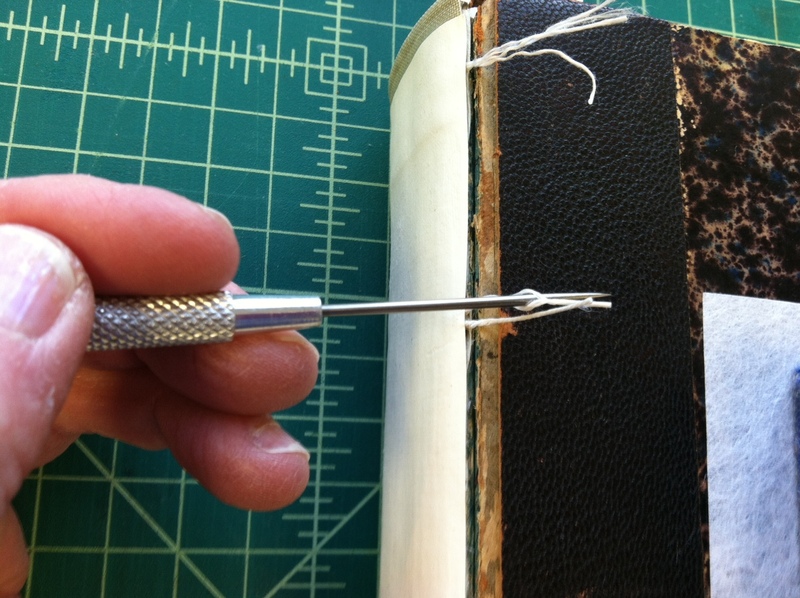 Next the thread tails are trimmed to the length that will fit under the lifted cover material (or paste-down), and then they are frayed out by untwisting the 3 plies first with your fingers, and then using a needle or awl to separate them further. 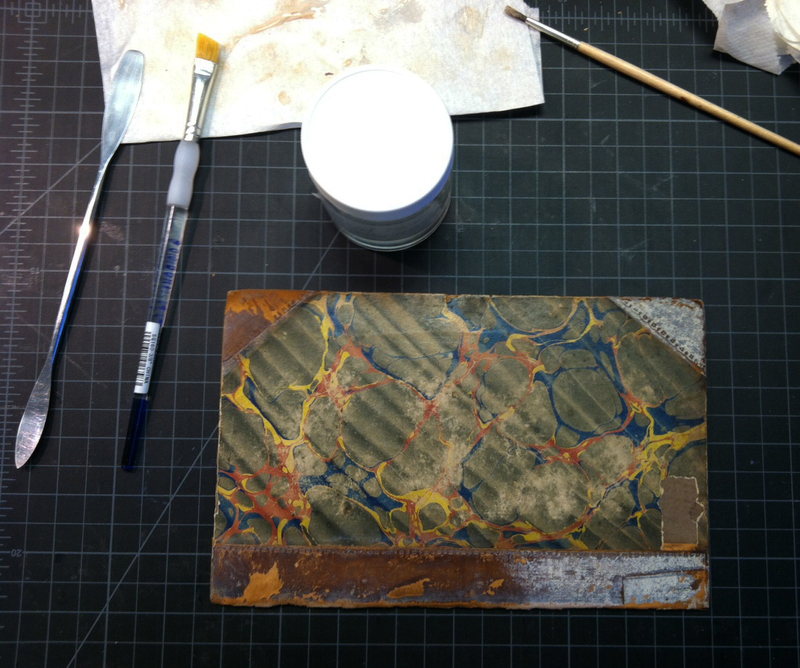 Board in place on the text block. This is a different book than the other photos! and the thread tails are adhered under the lifted cover material. The threads are splayed out, and made tight and flat using first a brush and then rubbing down/pushing inward with a spatula. 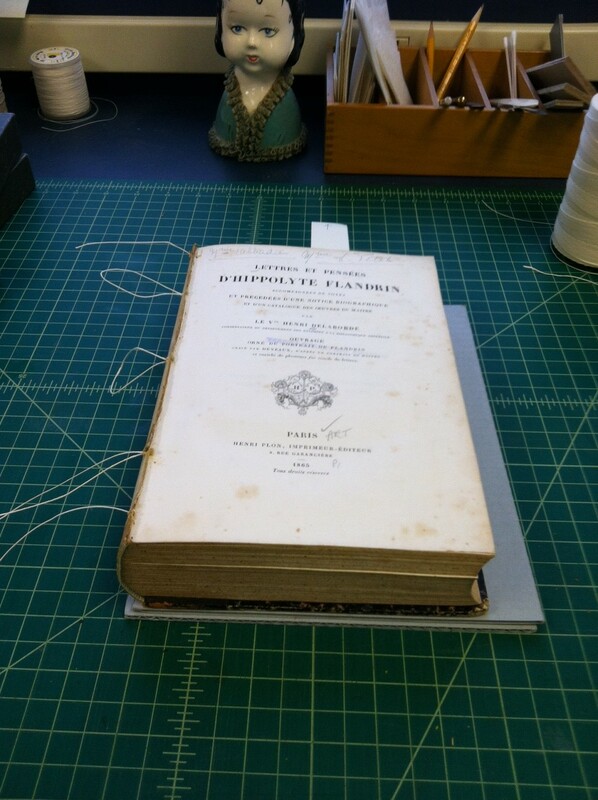 The finished book, Lettres et pensees d’Hippolyte Flandrin, Paris, 1865. 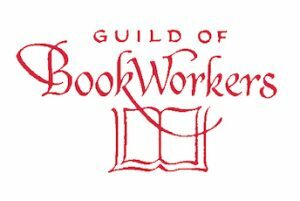 We enjoyed the visit from the Guild of Book Workers Midwest Chapter, and it was fun sharing some of our work! 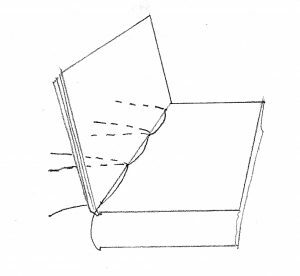 “Integrated Book Repair,” by Gary Frost, Archival Products News, v.7, no. 3, Fall/Winter 1999-2000. “Identifying Standard Practices in Research Library Book Conservation,” Library Resources & Technical Services (LRTS), v. 54, no. 1, 2010, pages 21-39. 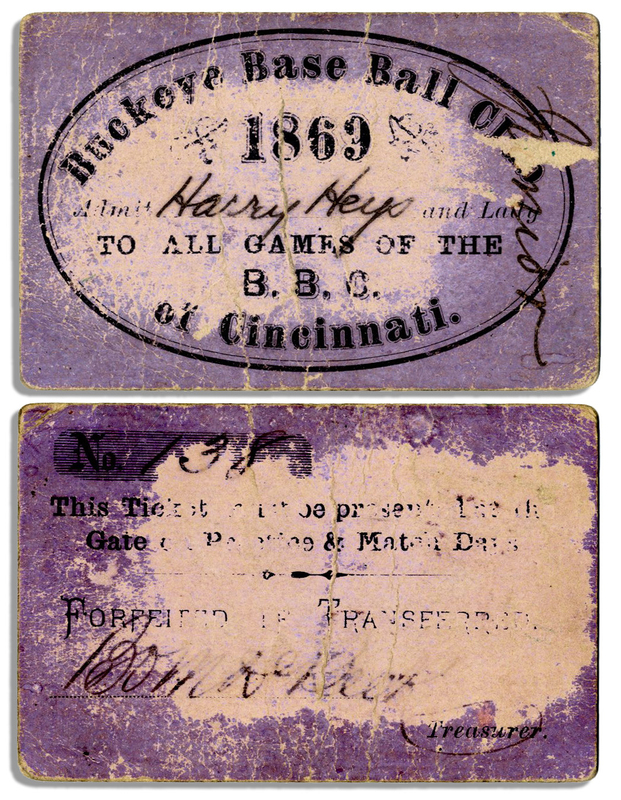 What could a ticket to a Cincinnati Buckeyes baseball game in 1869 have in common with a book of Sophocles’ works in Latin and Greek? Sophoclis tragoediae septem / ad optimorum librorum recensuit et brevibus notis instruxit I. [i.e., C.] G.A. Erfurdt. The connection is that B.O. 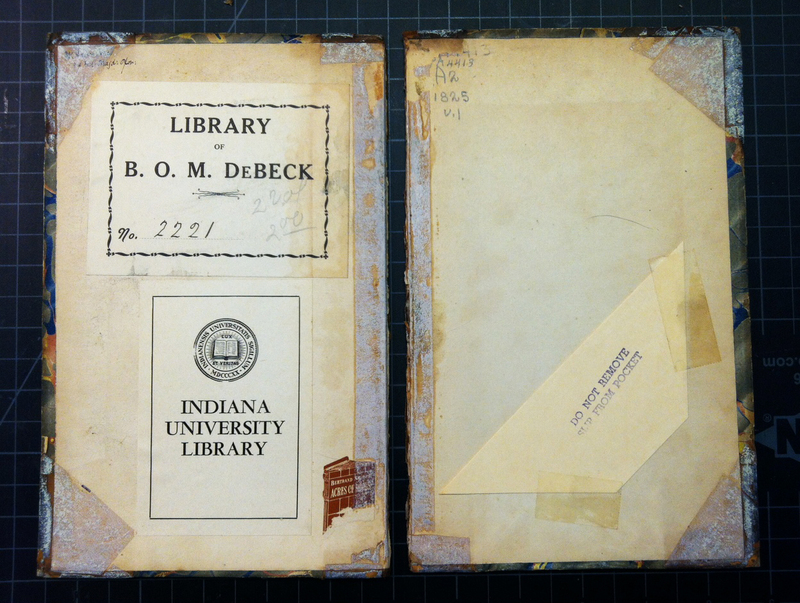 M. DeBeck is the former owner of said book, now in the collection of the Indiana University Bloomington Libraries. 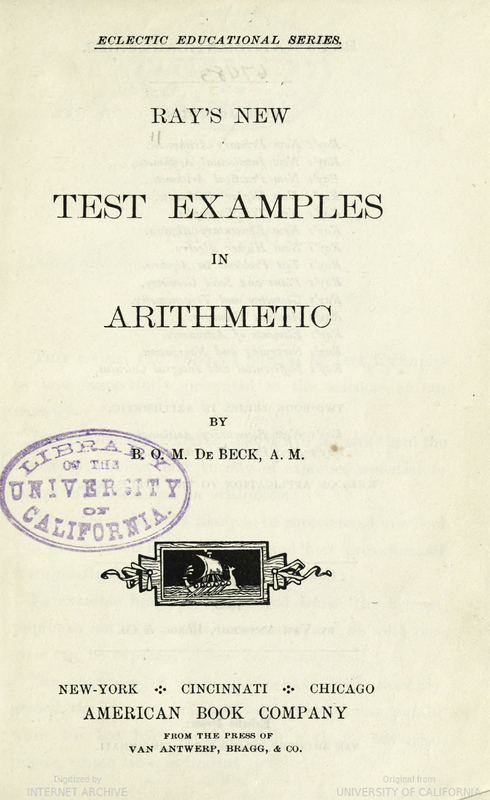 Inside covers with DeBeck’s bookplate. Note the crusty, whitish-gray residue from book cloth tape. 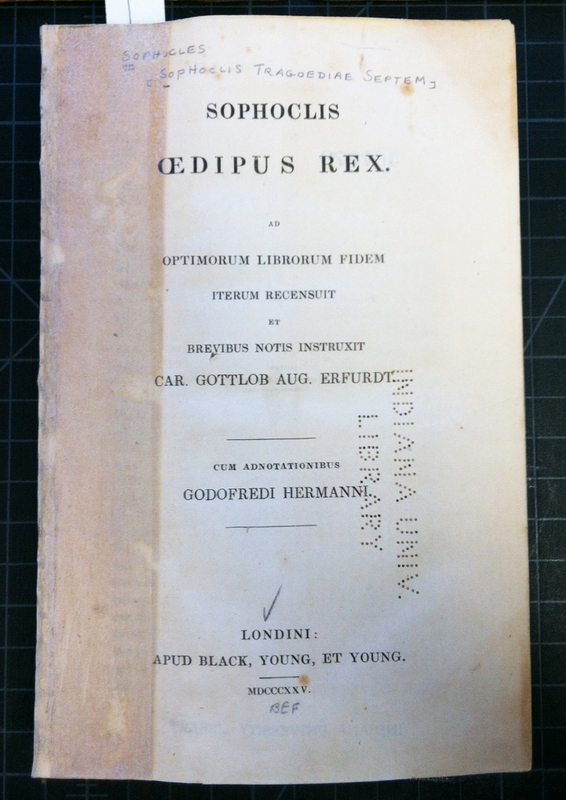 And from the number 2221 on the bookplate, it seems that DeBeck had quite a substantial library. A little more poking around on the old Internets reveals that besides playing baseball, B.O.M. DeBeck was a teacher in the Cincinnati public schools. The sad state of DeBeck’s Sophocles is all too common. 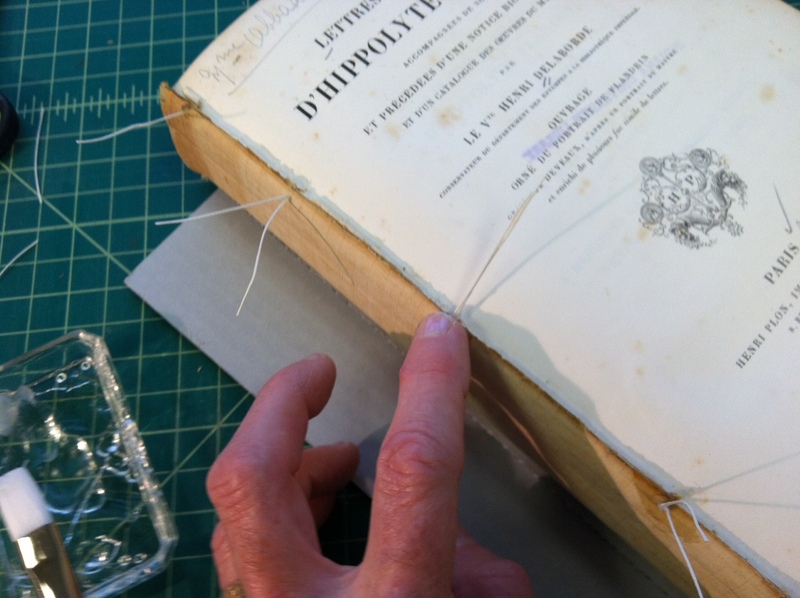 In the distant past, book repair in libraries meant the creative and copious application of tape. Now we spend our time removing it. The long, wide piece in the center was covering the spine leather, the two long narrower pieces on either side were stuck to the first and last pages of text, and the 4 triangular pieces covered the corners of the both covers. That orangey thing at the top is the only remnant of the original spine. Fortunately, I have an effective method to reduce / remove the dry, crust of adhesive that this type of book cloth tape leaves behind. 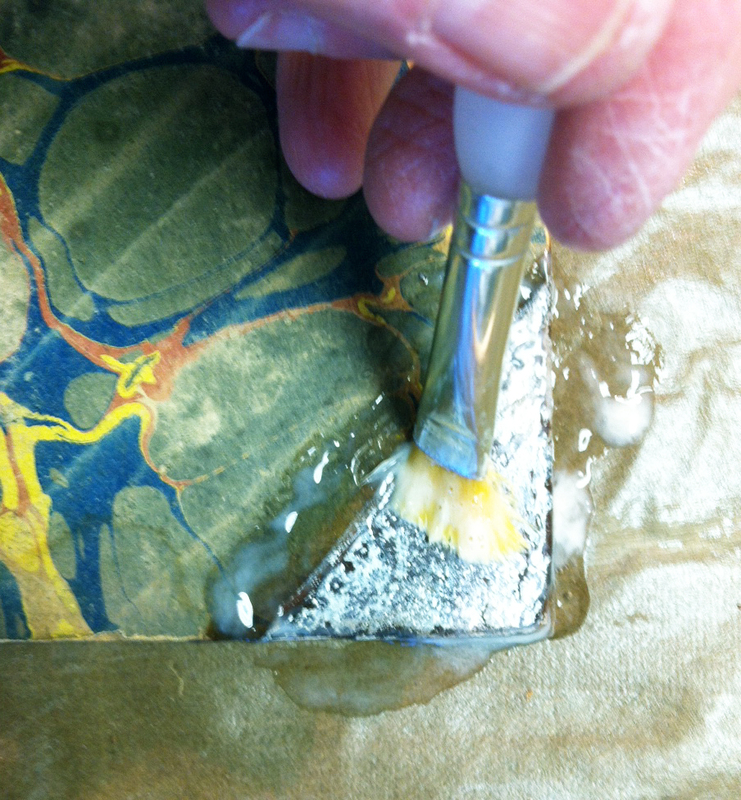 Klucel G in isopropanol is applied, and then “scrubbed” with a soft brush. The crud softens, and can be wiped away. It usually take a few applications. I have used this technique with success on cloth and paper too, although it does nothing about the dark brown stains that penetrate the paper, as seen on the left edge of the title page below. 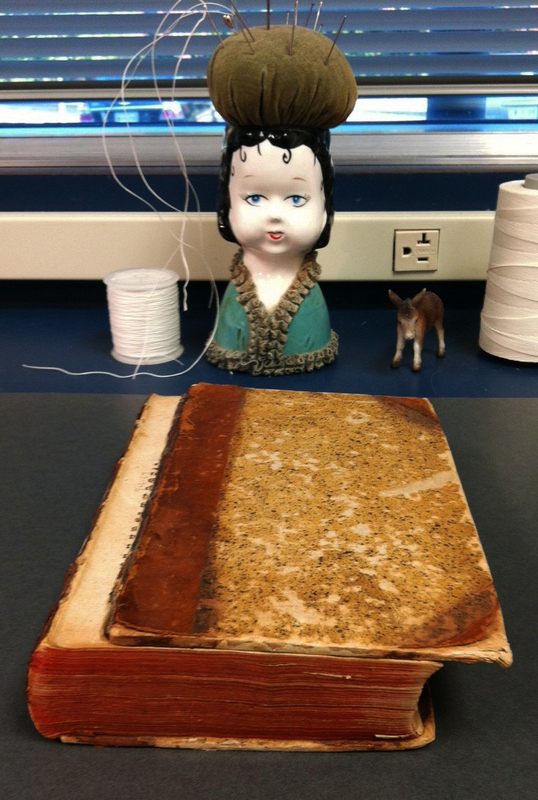 Mr. DeBeck’s book, sans tape and once again in useable condition. 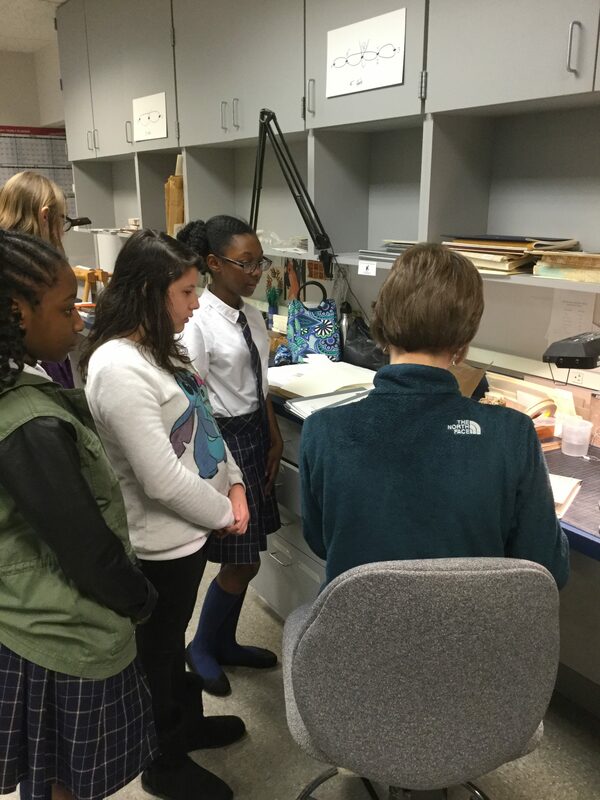 This week the Preservation Department hosted Bloomington’s Girl Scout Troop 3468. 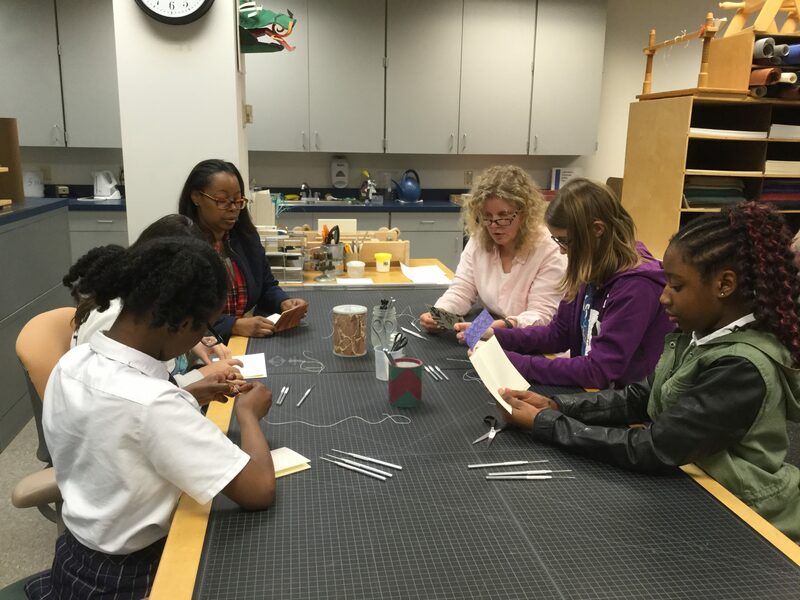 They came to learn about book arts so they could earn their Book Artist Badge. and learn about how they were constructed. 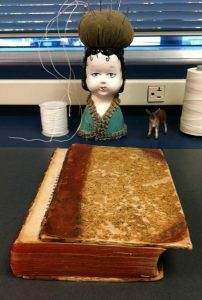 Chelsea Hoover demonstrated pamphlet sewing. Anitta Salkola-White taught them step-by-step how to make their own blank books using both 3- and 5-hole pamphlet sewing patterns. Doug Sanders, Lara Tokarski, and I helped them make their pamphlets. It was fun for everyone! 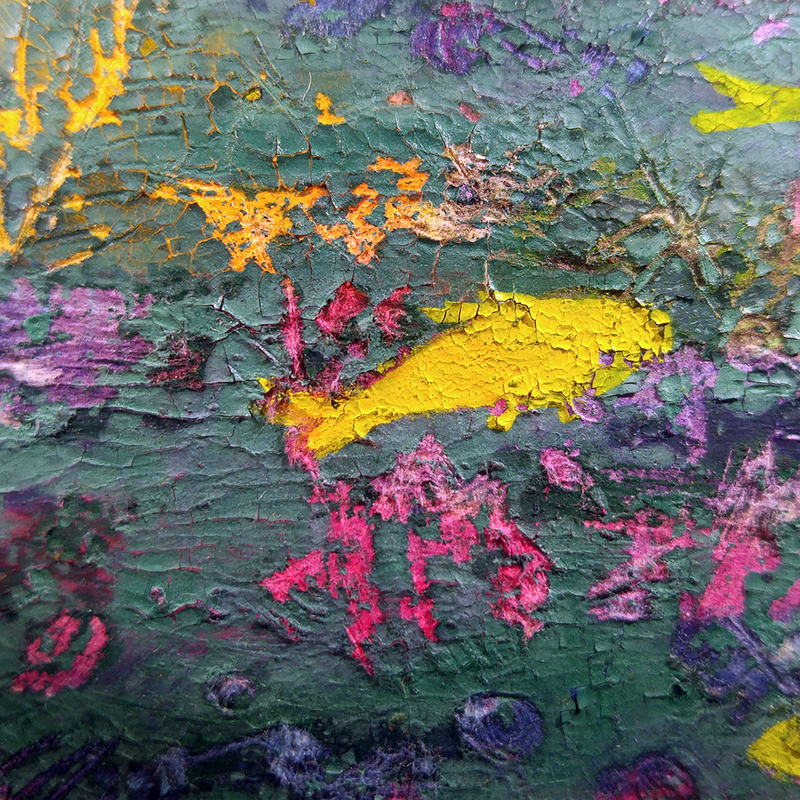 Some of our work is repetitive, tedious, perhaps meditative. For the hour I spent taking this book apart, stitch by stitch, I remembered this advice from long ago. That was way before I became a librarian, or even gave a thought to the idea that you could repair books. I had a job working in the vast, dark, back room of a downtown retail furrier shop. My job was to repair all the coats brought in for cold storage and cleaning in the summer — all the holes in the fur’s skin, loose linings, fallen-off buttons, snaps, and hooks. I worked with Bogdan, the furrier, who made new coats, and Stephania, who did alterations. The very first thing Stephania taught me was what to do if I saw a loose thread sticking out of the coat. Said in the wonderful Polish accent with which she also told about her childhood experiences in a forced labor camp during WWII, and traditional recipes she liked to make, such as plum tarts and brains. I only tried the plum tarts. 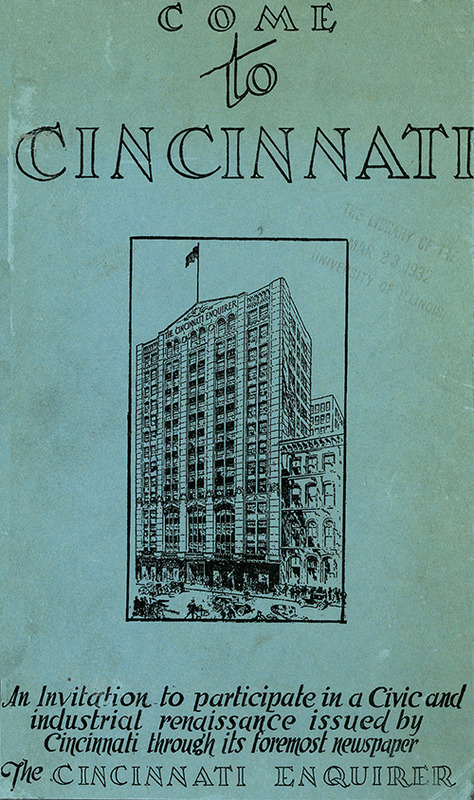 The book, Welcome to Cincinnati, was brittle and oversewn. Many pages were broken off, leaving some text on the stubs still attached to the binding with gobs of thread and stitches, otherwise known as oversewing. The result of oversewing is much the same as when you rip pages out of a spiral-bound notebook. 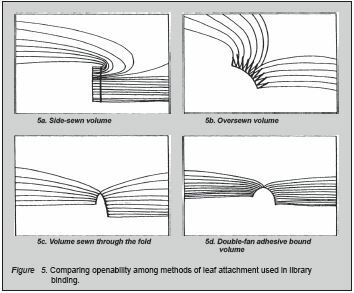 Oversewing is a method of binding a text block that consists of individual sheets of paper, rather sections of folded pages. It is very strong, but also very difficult to repair. 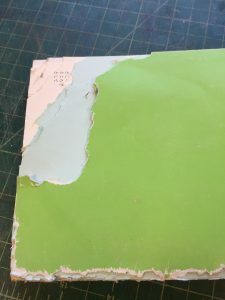 Oversewing has been replaced, for the most part, with double-fan adhesive binding — a durable, yet more easily reversible binding. 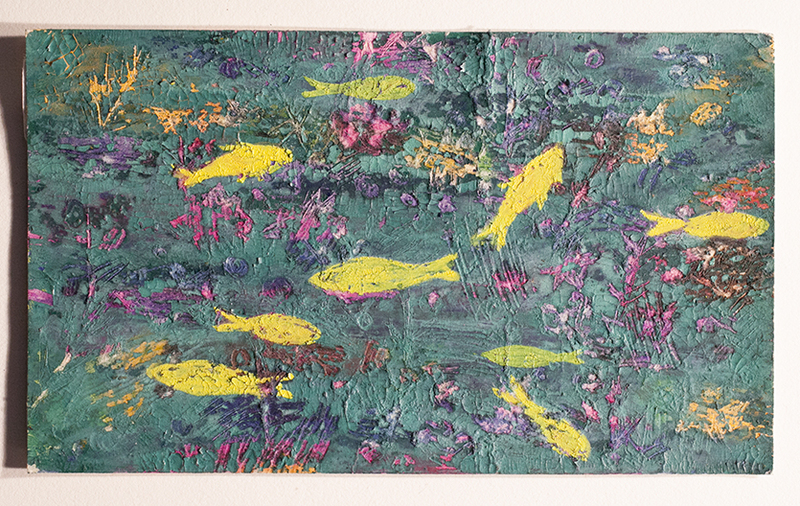 Oversewing combined with brittle paper is a recipe for disaster. 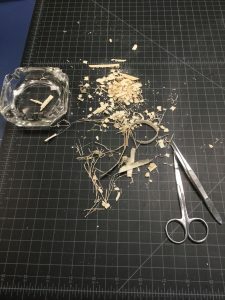 Pulling on the thread would result in more damage and I didn’t want to make even more jigsaw puzzle pieces that I would have to put back together. So, with tweezers, fine scissors, and a microspatula, I snipped and snipped and snipped until each each stub was free of the snarl of stitches. Then I rejoined the remnants of each page so they could be scanned. There are only a few copies of this book in libraries across the US, and our copy has circulated sort of a lot, which seems natural since it is about one of the big cities in a neighboring state. I like to believe that no experience, however humble, is a waste of time. Little do we know how things we learn along the way may turn out to be valuable later on. Posted on January 17, 2017 January 17, 2017 by Author Elise Calvi Posted in Categories Uncategorized | 1 Comment on Don’t Pull, Just Cut! 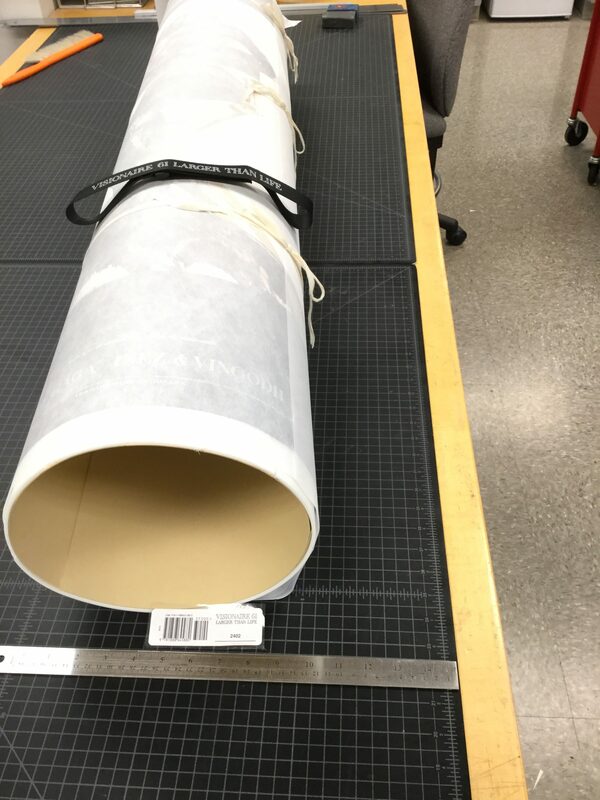 As a Paper Conservator, most of my time at work is spent on performing conservation treatments on the vast and varied collections within Indiana University Libraries. When not actively treating items, I coordinate with collection managers, curators, librarians and archivists to generate incoming work and establish priorities for the future. In the lab we also have responsibilities towards supervision of staff, disaster recovery across campus, establishing access protocols, environmental monitoring, and other minor roles that crop up here and there. However, one task that brings me a great deal of satisfaction, though not strictly a job responsibility, is teaching. Each academic term I guest-lecture for a number of courses within our Department of Information and Library Science and the Department of Art History. These sessions provide me with a welcome break from the Lab and hopefully give the students a new perspective on topics being covered in classrooms. The greatest pleasure I get from being employed within a university is the exchange of knowledge across disciplines- and the fact that I’m able to add to that is a reward. To be a Conservator often means having knowledge in a number of associated fields beyond our strict job skills; knowledge that can supplement teaching in a way that may be difficult for an instructor to cover by themselves. 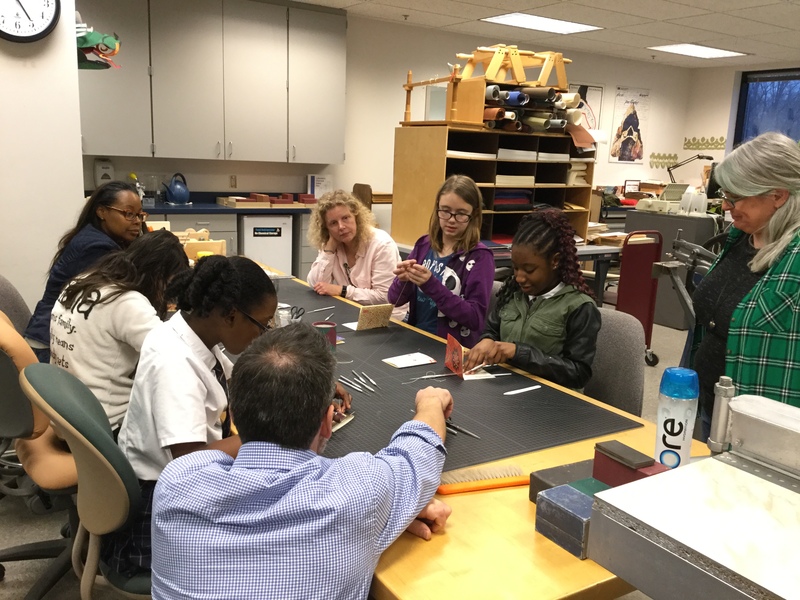 Some classes are more theoretical: I teach library students preservation theory, the role of the conservator in special collection libraries and treatments conservators perform on library collections. 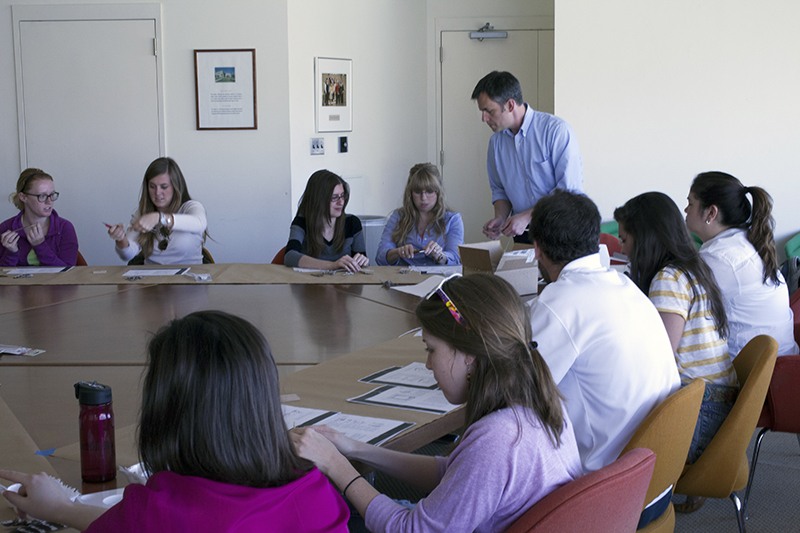 Some provide supplemental knowledge to future catalogers: print and photograph identification, paper and parchment terminology. 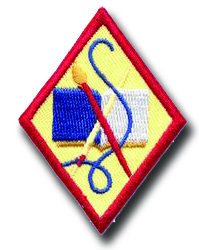 Others are more hands-on: materials and techniques classes or instruction in minor repair of paper-based collections. On top of this, we conservators get requests for a number of adult-education/public library sorts of lectures on preserving home collections, scrapbooking, etc. to which we’re always happy to consent. Preaching to the choir is one thing, but I think a greater reward comes from sharing our enthusiasm with others. Establishing a positive image of the conservation profession early in a student’s career training goes a long way towards developing effective preservation efforts into the future. “A situation where someone needs to perform a task but the method to complete the task doesn’t exist so she has to create the solution herself. It derives from “rolling your own” cigarettes versus buying pre-made cigarettes. How is this relevant to our work in Preservation? We decided to take a do-it-yourself approach recently when an issue of the luxury art and fashion journal, Visionaire, presented us with something of a challenge. 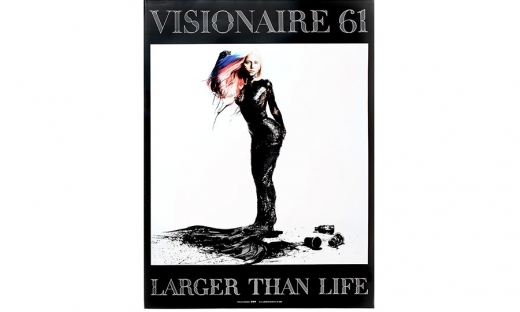 This special issue of the journal Visionaire, titled “Larger than Life,” features Lady Gaga on the cover and measures 36 x 50 inches. 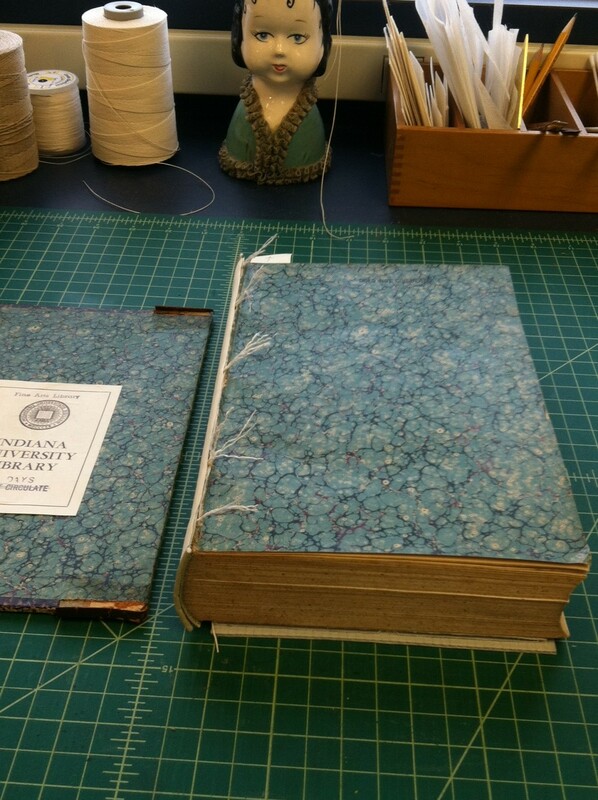 This journal issue was too large to be stored flat. 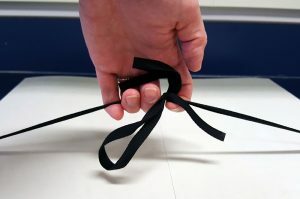 And although rolling is not ideal, as it may introduce a permanent curl, an object can be rolled onto the outside of a large-diameter tube to minimize this problem. This also avoids the damage that can occur when the object is put inside the tube. 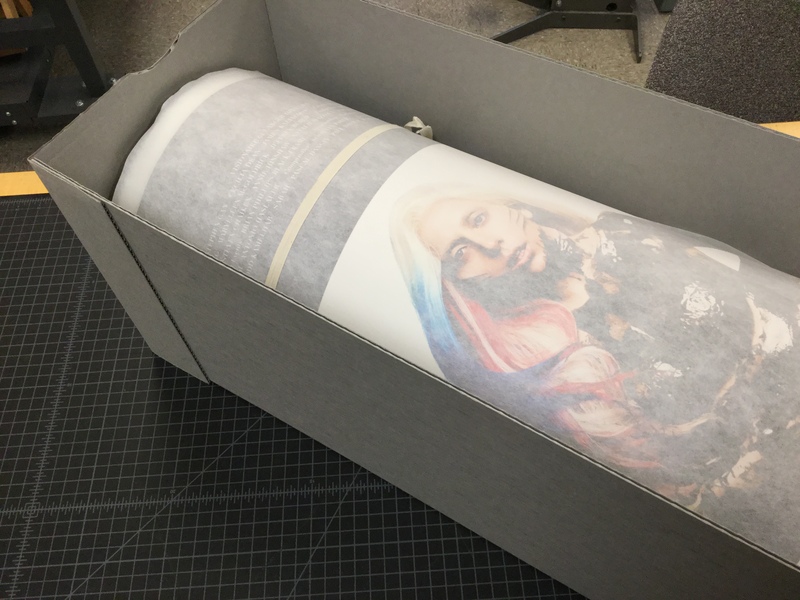 So we decided we would buy a 10” diameter tube, roll the journal issue (consisting of just a few pages) around the tube, and make a box to put the tube in. Easy. Oh, just one problem – one tube costs $100! Being thrifty, and not shying away from a challenge, we decided to try to make our own darn tube. We were not sure it would work! But we took a large sheet of 40-point acid-free board, rolled it up so it was about 8 inches in diameter, and held it together with many rubber bands. Then we just let it sit there like that for few months. Every so often, we do a group project on a Friday. We like to call these “Fun Fridays.” Sometimes we tackle a project that needs many hands; other times we learn and practice a new technique. Previous Fun Fridays have included making pre-coated repair tissues and forming an assembly line to construct a large batch of Kasemake boxes for delaminating lacquer disk recordings. So, after a few months passed, we decided to set the roll free one Friday. We took off the restraints. It looked good! We got the ends of the roll aligned and positioned so it was 10 inches in diameter. We debated how best to affix the inner and outer long edges of the board, both to maintain the diameter and keep the outer end of the board from forming a ridge. 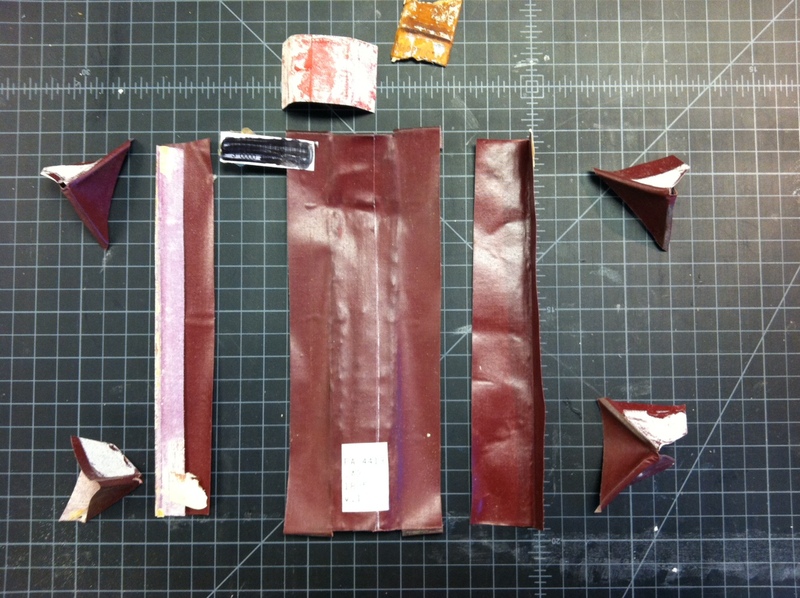 After considering PVA, packaging tape, sewing, and 3M 415 double-sided tape, we decided on the double-sided tape. Some of us were more confident about the efficacy of this choice than others, which created some suspense! We applied it to both the inner and outer edges of the board. It took three pairs of hands, but it held! Then we cut a sheet of Volara, an inert foam, to cover the roll, so the two long edges would meet exactly. We stuck that on with double-sided tape too. 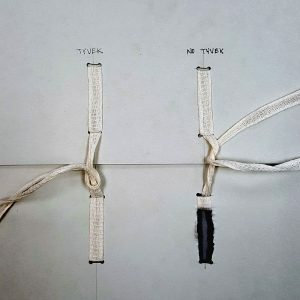 Anitta Salkola-White (left) and Lara Tokarski (right) marking a pencil line to guide the positioning of the Volara, after the long edges of the tube were stuck down. Then we cut a piece of Hollytex the length of the tube, and about 8 inches wider than the object. We laid the object on top of the Hollytex and rolled the two onto the tube together, so that the extra 8-inch tail of Hollytex fully covered the object. We tied it with woven cloth ties. 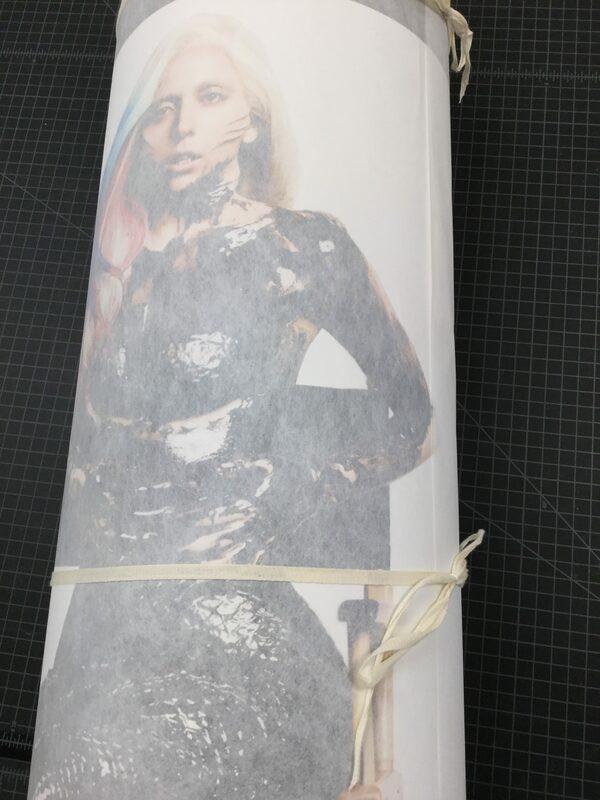 The journal issue rolled onto the Volara-padded tube, with a Hollytex liner, and tied with cloth tie. Finally, we made a box with a lid out of acid-free corrugated board on our Kasemake machine. The 40 x 60-inch board stock was not long enough to make the bottom out of one piece, so we cut separate rectangles with 3 flaps to cover each end and glued them in place. So, no, we didn’t have to “roll our own” , we could have just bought the $100 tube. But we learned it was possible to make one using materials already on hand in our lab, and had a great Fun Friday working together to solve a problem.